nowing that meanwhile our friend Holli had arrived in Timbuktu and was eagerly awaiting us, we didn't spend much time in Ouagadougou, Burkina Faso's capital. We only paid a visit to an American friend whom we had met in Ghana and who had invited us to call on him. 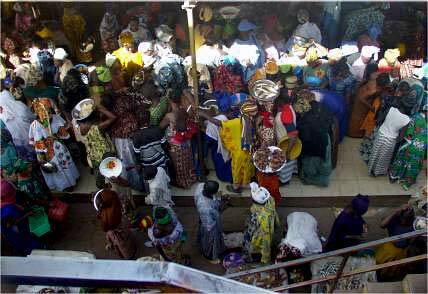 Apart from that, what I remember from Ouagadougou is the young women, their hair adorned with silver coins, strolling about the colourful main market. fter Ouaga, our daily progress was reduced to 150 to 200 kilometers a day due to insufficient transportation infrastructure and adverse road conditions. Often we'd spend endless hours waiting for a connecting vehicle. Comfort was at its barest minimum. One leg of the journey we rode in a pickup whose canvas cover wasn't up to the challenge of the torrential rains; wet and shivering from the cold wind we felt utterly miserable, the more so as it was the second time within a few days we got soaked. Often the only available transportation was not buses, but trucks or other vehicles. The drivers charged the usual bus fare despite offering much less in comfort. As long as the weather was dry, we didn't mind. Thus we arrived at Mopti, our first destination in Mali, by truck. Mopti is located at the junction of the Niger River and the Bani River, almost halfway between Timbuktu and Bamako, Mali's capital. 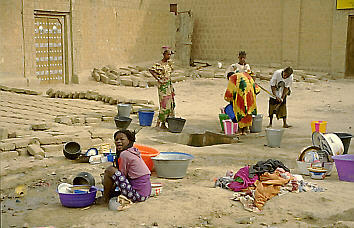 The Niger has long been a major avenue for trade across West Africa. Large canoes, sometimes powered by outboard engines, loaded with freight and passengers, travel from port to port along the great river. 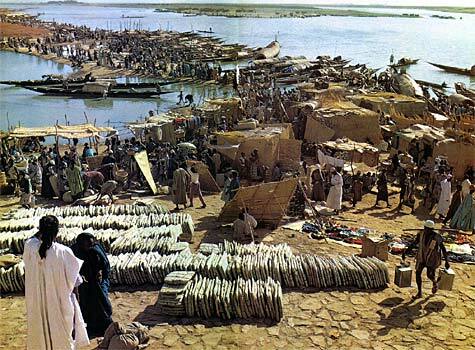 The port of the city of Mopti was one of the great trading centers of all of Africa in the 14th to 19th centuries and continues to be important for local commerce. t didn't take long to find sleeping quarters in a campement, consisting of a tiny one-bed room with a straw-filled mattress. In the evening we went for a walk about town. Strolling leisurely through the streets, we passed one of the major attractions in Mopti, the impressive Komoguel Mosque, patterned after the famous mosque at Djenné and built of adobe in the typical West African Sahel style. What we noticed in Mopti was the significant increase of people that ostensibly weren't beggars asking money from us, the reason for this possibly was that quite a few travelers passed through the town on their way to Timbuktu. We returned to our lodgings past nightfall, and thus had to use a flashlight to find our way. So it happened that at the campement's unlighted entrance, the beam of our flashlight passed over a man sitting on the ground. This caused the fellow to jump up and angrily reprimand us, claiming that in Mali it was prohibited to point a flashlight at people. He probably hoped we'd pay him a compensation for the committed "offence". Fat chance! 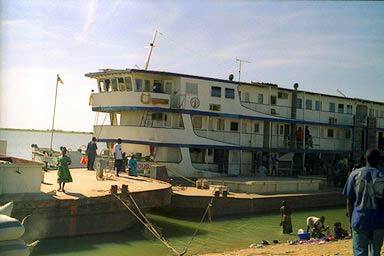 Next morning we made our way to the river port, where we purchased our boat tickets for Timbuktu. 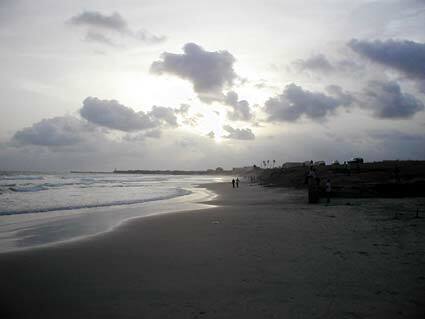 pread over three islands, Mopti is a busy, colorful trading town, and home to West Africas biggest salt market. Apart from salt, vendors sell fish, cloth, leather goods, masks, jewelry, amber and intricately woven Fulani wedding blankets. I bought myself one of those beautiful woolen blankets, and it is still in my possession today, some thirty years later. Probably because nobody likes to use it, its wool is rather scratchy. he journey to Timbuktu by a large commercial boat lasted 2 days, with the night spent sleeping on deck in some corner, on and among our bags. Except for us and a small, mixed group of Germans, the boat's passengers were Africans. The Germans had studied Africa at Berlin University and were convinced to know all that was to know about the continent. Actually they had no idea. A talk with them soon erupted into a very emotional verbal fight, with one of them getting so upset that a spray of spittle issued from his wide open mouth. Seeing that those students were too narrow minded to understand that real life is somewhat different from academic teachings and theories, we kept to ourselves for the rest of the journey. t various ports, the riverboat stopped to load and unload both passengers and goods. In the evening of the first day, at one such stop, several young women and girls approached the boat wading through the shallow water, carrying calabashes full of fresh milk to sell. What happened next was an exact copy of what we had witnessed in Ghana with the luckless cheese vendors: Passengers would haul the calabashes up to the decks, empty them of their contents and wait till the boat started to move again. Then they'd throw some small coins down into the murky water for the women to pick up. Crying women demanding adequate payment waded in vain after the leaving boat until the water got too deep for them and they started to loose their footing. It was a distressing sight to us; to most of the passengers though it once more was great fun. here the great sands of the Sahara meet the savannas of North Africa, lies the fabled city of Timbuktu. A mythical destination, Timbuktu is but a mirage of the imagination for most people. Getting off the boat, we instantly spotted a lank figure approaching. Who else could it have been but our old friend Holli, his head adorned by a turban, the bristles of his crew cut hair peeking through the cloth, trailed by a group of kids gaily shouting "Ivan" after him. With his blond and blue eyed looks, Holli could have passed for a Russian indeed. One of the passenger vehicles waiting to transfer the ship's passengers brought us to the town proper, located some 18 km from the river Niger. ot long and we were seated on the bare earthen floor of the rooms Holli had rented, drinking tea and smoking the grass we'd brought along from Ghana, exchanging the stories of the last months' adventures. Of course one of our main topics was the cruel fate of our other other friend, the one who had to return to Germany due to the recurrence of his bone cancer. Saddened and in a subdued mood our thoughts kept returning to him; knowing well that there was nothing we could do to help. With Timbuktu we had finally reached the goal of our journey, the fabled city in the desert that since the 12th century had been a forbidden place and one of the most august centers of Islamic learning and trade within Muslim society. Yet since the late 1800s, the city's importance had declined, drifting to the sandy edges of the Sahara desert and into the imaginations of the New World's folklore. Back when Timbuktu was one of the centers of the the Islamic world, scholars and students traveled from as far away as Cairo, Baghdad, and Persia to study from the noted manuscripts found in Timbuktu's great library. 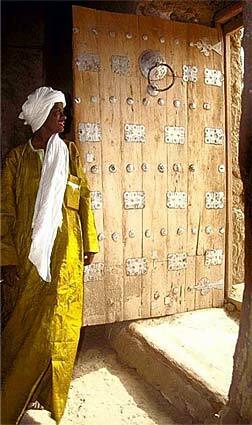 Respected scholars who taught in Timbuktu were referred to as ambassadors of peace throughout North Africa. n integral part of Timbuktu history was always trade - mainly the exchange of salt that came from the heart of the Sahara desert. Since the Middle Ages, camel caravans have navigated north from the fabled city of Timbuktu, in present-day Mali, West Africa, in search of the gold of the Sahara desert—salt. Traveling across the windswept sand dunes, caravans often numbering more than hundred have journeyed to the salt mines of Taudenni, 500 miles north of Timbuktu. A human necessity and source of commerce, salt has been in high demand in West Africa since the 12th century when it was first found in the sand dunes of the desert. Its discovery gave rise to a robust commodity trade that quickly paved a near-mythical trail connecting Timbuktu with Europe, southern Africa, and Persia. With the trade of Taudenni's prized salt, came the ability to move people, information, and ideas across the Sahara desert. To this day, camel caravans laden with salt, also known as "the gold of the desert," journey to Timbuktu, from where the salt is brought to the markets of the river towns of Mopti, Djénné, and beyond. ince the 12th century, accompanying the camel caravans rode the intrepid scholars of Islamic learning, bringing with them over time hundreds of thousands of manuscripts. The bound texts highlighted the great teachings of Islam during the Middle Ages. These sacred manuscripts covered an array of subjects: astronomy, medicine, mathematics, chemistry, judicial law, government, and Islamic conflict resolution. Islamic study during this period of human history, when the intellectual evolution had stalled in the rest of Europe, was growing, evolving, and breaking new ground in the fields of science, mathematics, astronomy, law, and philosophy within the Muslim world. By the 1300s the "Ambassadors of Peace" centered around the University of Timbuktu created roving scholastic campuses and religious schools of learning that traveled between the cities of Timbuktu, Gao, and Djénné, helping to serve as a model of peaceful governance throughout an often conflict-riddled tribal region. 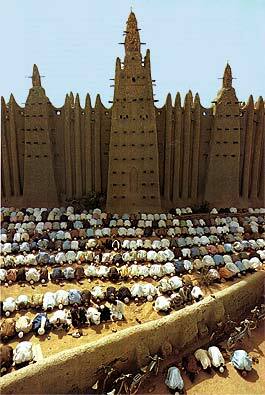 At its peak, over 25,000 students attended the University of Timbuktu. With the Moroccan invasions from the north at the beginning of the 1600s, however, the scholars of Timbuktu began to slowly drift away and study elsewhere. As a result, the city's sacred manuscripts began to fall into disrepair. While Islamic teachings there continued for another 300 years, the biggest decline in scholastic study occurred with the French colonization of present-day Mali in the late 1890s. Thousands of the sacred manuscripts lie in private collections that date back over some 600 years. The largest collection can be found at the Ahmed Baba Research Center. 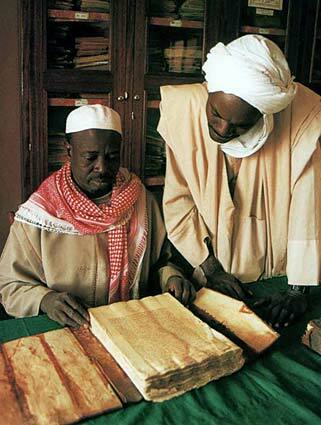 Some scholars estimate that there are over 700,000 manuscripts housed throughout collections in Timbuktu. With the pressures of poverty, a series of droughts, and a tribal Tuareg rebellion in Mali that lasted over ten years, the manuscripts continue to disappear into the black market, where they are illegally sold to private and university collections in Europe and the United States. Today Timbuktu is designated as World Heritage Site by the UNESCO. Through the efforts of the Timbuktu Heritage Institute, the manuscripts of Timbuktu are beginning to be re-catalogued, preserved, and protected against theft. 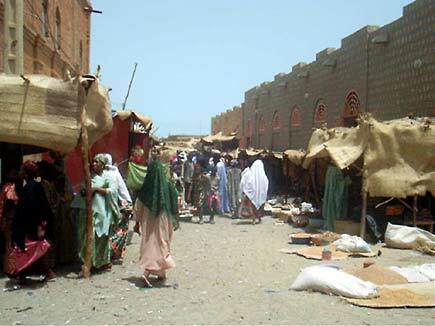 ven in our times, Timbuktu still holds the allure of its name. But clearly it has drifted to the edges of the desert as a dusty adobe outpost that holds defiantly onto the title of being the gateway to the mystical Sahara. 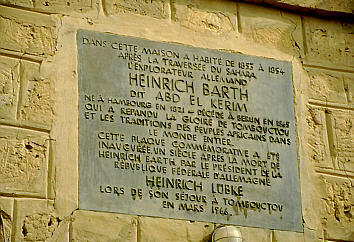 On several buildings in Timbuktu, plaques tell of the famous explorers who had once lodged there, most noteworthy among them the French adventurer René Caillié. If he wasn't the first European to visit legendary Timbuktu in 1828, at least he was the first who came back alive. All the predecessors of Caillié have been killed or died of disease, hunger or thirst. Over centuries the name Timbuktu aroused the avarice and curiosity of the Europeans, because the entrance to this sacred city of the Islam was forbidden for nonbelievers. espite its glorious past, to us Timbuktu turned out to be a disappointment in many ways: We'd seen a reportage about Timbuktu on TV back in Germany, where it had looked like something of an adventure to get there. In reality, American tourists flew in regularly just to send postcards back home. assing the the market shopping for groceries one morning, I spotted a middle aged woman sitting on the ground selling her wares, her wrist adorned by two huge bangles made of aluminum. Those bangles immediately caught my fancy, as I never had seen anything similar, but as I didn't like the idea of offering money to their owner, I didn't quite know what to do. 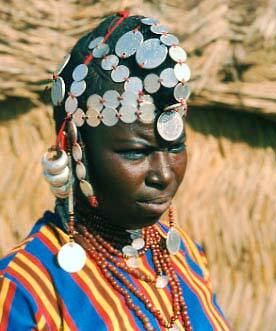 Had I asked her, the woman's obvious poverty certainly wouldn't have let her any choice but to sell her adornments. After perusing the problem for a while, a possible solution came to my mind. Worried the woman might leave, I hurried back to our room, to rummage through bags and bundles for a silver head ornament from Sri Lanka, embellished with glittering glass stones, of the type worn by Indian brides or dancers. Back at the market, with gestures I offered to the woman to exchange her bangles for that piece of foreign jewelry that, due to its exclusivity so far from its origins, was sure to become the very envy of her neighbors and friends. She was only too happy to comply. Equally satisfied, I forced the bangles over my hands, not to take them off anymore until about a year later in Egypt, where I was to get a pair of heavy silver ones. The second important purchase I made in Timbuktu was a neck purse of fine leather, of the type the Tuareg wear under their robes, to keep their money safe. The slim rectangular pouch had several compartments and a casing that could be slid up or down on the neck string to open or close. With its leather tassels and the carefully carved and painted geometric patterns on each of the compartments and the casing, it looked really neat; a genuine article of daily use. Of excellent quality, the purse was to serve its purpose for many years to come, until the day a thief ripped it right off my neck in India. Even then, despite having it worn every single day since I had bought it, its leather string still was strong enough to leave deep marks in the skin of my neck before it broke. Rice or pasta with a watery sauce made of dried onions and tomatoes was our main fare. Both the rice and the pasta, as everything else in Timbuktu, was full of sand, which caused a lot of damage to my teeth. 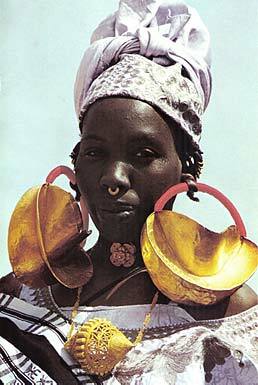 Altogether I broke and lost eight fillings during my time in West Africa . One of the few alternatives was to buy a tin of sardines, despite none of us really fancied rice with sardines. Eggs were on sale as well, they were anything but fresh though, and in every batch we bought, a few turned out to be outright rotten. After once breaking open an egg which, to my dismay, contained a half-finished chick, its tiny heart beating visibly, we started to take a small vessel with water along to the egg vendor: When immersed, the air contained in old eggs makes them float on top; we'd only buy those that sunk. Since that first plate of chicken in Niger, after seven years of being strict vegetarians, we had started to again eat a bit of meat once in a while. 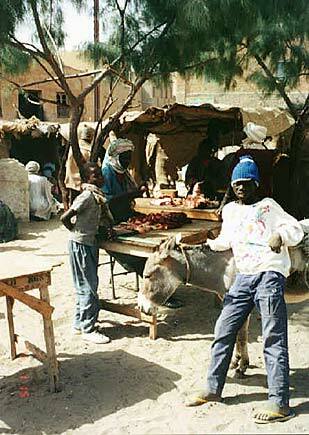 In Timbuktu we tried some very tasty roasted camel meat. oredom affected us much more than dietary monotony. There was nothing at all to do in Timbuktu. As in all the other West African places we had lived in or passed through, locals showed no interest whatsoever in getting to know us, or in any communication. Once in a while some fellow would appear at our doorsteps, but only in the hope of selling something to us; those visits stopped entirely once word got around we weren't interested in buying overpriced leather bags. stensibly Muslims, Timbuktu's inhabitants actually were a rather inhospitable lot. When our rubber container we used to draw water broke at a public well, we asked a group of loitering teenagers, long finished with filling their own vessels, to borrow us their bucket for a minute. Yes, of course they would - for a certain amount of CFAs! Such greedy behaviour towards travelers is unimaginable in a truly Islamic society. Worse happened to a friend. On a walk about town, he was gripped by a sudden onset of diarrhea. He knocked on the door of the nearest house, and, with a few gestures, explained his problem and asked if he might use the privy, usually consisting of a hole in the ground out back. Seeing in what a desperate situation the poor guy was, the house owner took advantage of the opportunity and made our friend pay an outrageous sum before he was allowed to relieve himself. ndless days slowly merged into weeks, spent mainly sitting quite lethargic in our hot lodgings, feeling sick of it all: The unpleasant food, the unfriendly natives, the waiting for our overdue letters. Even calm Holli started to suffer from erves and got involved in a quarrel with the local administration about some minor matter. Another bout of malaria did nothing to help improve our situation. One of the few available diversions was the local cinema, a small backyard affair were films were projected onto the whitewashed wall of an adjacent building. One movie shown was an old Indian black and white, featuring gods flying through the air on golden chariots and an unearthly pretty heroine. At every close up of that girl's beautiful face, heavy sighs of awe issued from the predominantly male spectators. The second movie we saw was black and white as well, a French thriller. In one scene the protagonist was caught in a basement room filling up with some inflammable liquid. On realizing the danger he was in, our hero quickly extinguished his lighter and the screen accordingly went black. This caused a great ruckus among the audience, who, failing to follow the plot, believed the film to be damaged and started to shout angry insults. The spectators wer by far more entertaining to watch than the actual film. sually there were at least a few fellow travelers in Timbuktu to talk to. Once, on meeting some American tourists interested in riding a camel, we arranged a small trip into the desert for them. Camels were easily found, and so we led our little group out for an afternoon's riding. We didn't gain a cent for our endeavors, we were just happy to escape from the usual boredom and immensely enjoyed riding a camel again after so many weeks. Often after sundown a visitor or two would drop in to share a cup of tea, a smoke, or just for a chat. One night thus a young lad from New Zealand, after having spent the evening at our place, set out to walk back to the campement around midnight. Halfway there, he felt a sting in his foot; which he took for a snake bite. Being rather stoned didn't help to curb his rising panic. Fearing for his life, he made it to the campement as fast as he could manage. There, he asked to be driven to the hospital immediately. A car and a driver were available, but the sum asked for the short ride was so exorbitant that our panicky friend, fearing to drop dead any instant, had to haggle for near to a quarter of an hour until some agreement was reached. Luckily, and to the boy's great relief, the alleged snake bite later turned out to be merely the sting of a scorpion. After receiving all the letters we had been waiting for, we were only too happy to leave what, in our opinion, was one of the most boring and graceless places we'd ever come across. The three of us decided to return to Ghana, the same way we had previously come, as fast as we could. ack in Accra, not knowing any other cheap lodgings, we once more checked in at the Ministry of Education Hostel. This time around it turned out to be much quieter than during our first visit. As before, we spent the days at our leisure and ate Mama's delicious cheese and rice in the evening. Once we felt like really indulging ourselves and went for a splurge to one of Accra's many Lebanese restaurant, for a taste of old favorites like hommos. Accra was still to have an unpleasant surprise in stock for us. One sultry afternoon Holli, along with a Scottish girl, her British husband and another Brit left for a swim at one of the city's main beaches. Never having been much of a beach rat, I didn't care to accompany them. It was dark when the group returned to the hostel, minus Holli and in great agitation. The Scottish girl's hands were covered with bleeding cuts, and our friends had a horrifying story tell: Around dusk, when most other swimmers had left, the small group had gotten attacked by a gang of robbers, one of them sticking a knife into Holli's chest. Immediately taking a taxi to the hospital, we found our friend laying pale as a sheet in his bed, a bloodied bandage adorning his chest where the knife had pierced his lung. The doctors told us how lucky Holli had actually been: if the knife had entered the lung a mere few centimeters higher up, the wound might well have killed him. As it was, after two weeks at the hospital Holli was his old self again. Meanwhile the Scottish girl, despite having her cuts and a police report as proof of the mugging, only got a refund for her stolen American Express traveler checks after some resolute intervention on part of her father back home. By the time Holli returned to the hostel, some money had arrived for us from the American friend we had sent the handicrafts to. Consequently, the three of us booked a flight that was to bring us to a place as different from West Africa as the day differs from the night: the "Mother of all Cities", magical, marvelous and hospitable Cairo.